Steel is an extremely useful alloy, with iron as its major component and a carbon content between 0.02 and 1.7 percent by weight. An alloy is the combination of metal with other chemical elements (metallic or nonmetallic), forming a solution or chemical compound that retains metallic properties. Generally, a number of properties of the alloy are significantly different from those of its components. An alloy with two components is called a binary alloy; one with three is a ternary alloy; one with four is a quaternary alloy. Among commonly known alloys are brass, bronze, and steel. Some alloys are named after their primary constituent. For example, the "silver" used in jewelry and the "aluminum" used as a structural building material are actually alloys. Alloys of gold are rated on a scale of carats—for instance, 14-carat gold is 58 percent gold. The term alloy is sometimes used loosely as a synonym for aluminum alloy, such as when referring to alloy wheels fitted on automobiles. Alloys are usually designed to have properties that are more desirable than those of their constituents. For instance, steel is stronger than iron, its main element. 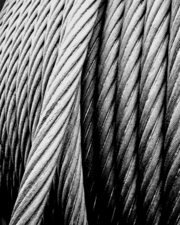 The alloy inherits some of the characteristics of the elements it was made from—usually properties such as density, reactivity, electrical conductivity, and thermal conductivity. By contrast, properties such as tensile strength, Young's modulus, and shear strength can differ vastly from those of its constituent materials. These differences are caused by various factors, including the packing of atoms of differing sizes within the alloy. Larger atoms exert a compressive force on neighboring atoms while smaller atoms exert a tensile force on their neighbors. Consequently, an alloy tends to resist deformation more than a pure metal, in which the atoms can move more freely. Unlike pure metals, most alloys do not have a sharp melting point. Instead, they melt over a temperature range in which the material is a mixture of the solid and liquid phases. The temperature at which melting begins is called the solidus, and that at which melting is complete is called the liquidus. For most pairs of elements, however, there is a single, sharp melting point when the elements are in a particular ratio, called an eutectic mixture. Any alloy of mercury is called an amalgam. Most metals are soluble in mercury, but some (such as iron) are not. Amalgams are commonly used in dental fillings because they have been relatively cheap, easy to use, and durable. In addition, until recently, they have been regarded as safe. They are made by mixing mercury with silver, copper, tin, and other metals. The mercury content of dental fillings has recently stirred controversy, based on the potentially harmful effects of mercury. Mercury amalgams have also been used in the process of mining gold and silver, because of the ease with which mercury amalgamates with them. In addition, thallium amalgam is used as the liquid material in thermometers, because it freezes at -58°C, whereas pure mercury freezes at -38°C. 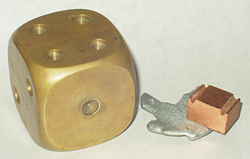 A decorative brass paperweight (left), along with zinc and copper samples. Brass is the term used for alloys of copper and zinc in a solid solution. It has a yellow color, somewhat similar to gold. It was produced in prehistoric times, long before zinc was discovered, by melting copper with calamine, a zinc ore. The amount of zinc in brass varies from 5 to 45 percent, creating a range of brasses, each with unique properties. By comparison, bronze is principally an alloy of copper and tin. Despite this distinction, some types of brasses are called bronzes. Brass is relatively resistant to tarnishing and is often used for decorative purposes. Its malleability and acoustic properties have made it the metal of choice for musical instruments such as the trombone, tuba, trumpet, and euphonium. Although saxophones and harmonicas are made out of brass, the saxophone is a woodwind instrument, and the harmonica, a free reed aerophone. In organ pipes designed as "reed" pipes, brass strips are used as the "reed." Aluminum makes brass stronger and more corrosion-resistant. It forms a transparent, self-healing, protective layer of aluminum oxide (Al2O3) on the surface. Tin has a similar effect and finds its use especially in seawater applications (naval brasses). Combinations of iron, aluminum, silicon, and manganese make brass resistant to wear and tear. Assorted ancient bronze castings found as part of a cache. Bronze refers to a broad range of copper alloys, usually with tin as the main additive, but sometimes with other elements such as phosphorus, manganese, aluminum, or silicon. Typically, bronze is about 60 percent copper and 40 percent tin. The use of bronze was particularly significant for early civilizations, leading to the name "Bronze Age." Tools, weapons, armor, and building materials such as decorative tiles were made of bronze, as they were found to be harder and more durable than their stone and copper predecessors. In early use, the natural impurity arsenic sometimes created a superior natural alloy, called "arsenical bronze." Though not as strong as steel, bronze is superior to iron in nearly every application. Bronze develops a patina (a green coating on the exposed surface), but it does not oxidize beyond the surface. It is considerably less brittle than iron and has a lower casting temperature. Several bronze alloys resist corrosion (especially by seawater) and metal fatigue better than steel; they also conduct heat and electricity better than most steels. Bronze has myriad uses in industry. It is widely used today for springs, bearings, bushings, and similar fittings, and is particularly common in the bearings of small electric motors. It is also widely used for cast metal sculpture and is the most popular metal for top-quality bells and cymbals. Commercial bronze, otherwise known as brass, is 90 percent copper and 10 percent zinc. It contains no tin. Pewter is traditionally composed of 85 to 99 percent tin, with the remainder consisting of copper, which acts as a hardener. Lead is added to lower grades of pewter, giving a bluish tint. Traditionally, there were three grades of pewter: fine, for eatingware, with 96 to 99 percent tin and 1 to 4 percent copper; trifle, also for eating and drinking utensils but duller in appearance, with 92 percent tin, 1 to 4 percent copper, and up to 4 percent lead; and lay or ley metal, not for eating or drinking utensils, which could contain up to 15 percent lead. Modern pewter mixes the tin with copper, antimony, and/or bismuth rather than lead. Physically, pewter is a bright, shiny metal that is similar in appearance to silver. Like silver, it oxidizes to a dull gray over time if left untreated. It is a very malleable alloy, being soft enough to carve with hand tools. It also takes good impressions from punches or presses. Given this inherent softness and malleability, pewter cannot be used to make tools. Some types of pewter pieces, such as candlesticks, were turned on a metal lathe, and these items are sometimes referred to as "holloware." Pewter has a low melting point (around 225 to 240°C), depending on the exact mixture of metals. Duplication by casting gives excellent results. The use of pewter was common from the Middle Ages up until the various developments in glass-making during the eighteenth and nineteenth centuries. Pewter was the chief tableware until the making of china. With the mass production of glass products, glass has universally replaced pewter in daily life. Today, pewter is mainly used for decorative objects such as collectible statuettes and figurines, replica coins, and pendants. Nickel silver is an alloy of copper, nickel, and often (but not always) zinc. It is named for its silvery appearance and contains no elemental silver. Other common names for this alloy are German silver, paktong, new silver, and alpacca (or alpaca). Many different formulations of alloys fall in the general category of "nickel silver." Besides containing copper, nickel, and zinc, some formulations may include antimony, tin, lead, or cadmium. A representative industrial formulation (Alloy No.752) is 65 percent copper, 18 percent nickel, and 17 percent zinc. In metallurgical science, such alloys would be more properly termed nickel bronze. Some nickel silver alloys, especially those containing high proportions of zinc, are stainless. The earliest use of nickel silver appears to have been in China. It became known to the West from imported wares called Paktong or Pakfong, where the silvery metal color was used to imitate sterling silver. It was discovered to be an alloy composed of copper, nickel, and zinc in the eighteenth century. Nickel silver first became popular as a base metal for silver-plated cutlery and other silverware, notably the electroplated wares called "E.P.N.S." (electro-plated nickel silver). It is used in zippers, costume jewelry, and musical instruments (such as cymbals). After about 1920, its use became widespread for pocketknife bolsters, due to its machinability and corrosion resistance. In some countries, it is used in the production of coins. Its industrial and technical uses include marine fittings and plumbing fixtures for its corrosion resistance, and heating coils for its high electrical resistance. Steel is an alloy composed mainly of iron, with carbon content between 0.02 and 1.7 percent by weight. Carbon is the most cost-effective alloying material for iron, but many other alloying elements are also used. Carbon and other elements act as hardening agents, preventing iron atoms in the crystal lattice from sliding past one another. By varying the amount of alloying elements and their distribution in the steel, one can control its qualities such as hardness, elasticity, ductility, and tensile strength. Steel with increased carbon content can be made harder and stronger than iron, but it is also more brittle. The maximum solubility of carbon in iron is 1.7 percent by weight, occurring at 1130 °C. Higher concentrations of carbon or lower temperatures produce cementite, which reduces the material's strength. Alloys with higher carbon content than this are known as cast iron because of their lower melting point. Steel should also be distinguished from wrought iron, with little or no carbon (usually less than 0.035 percent). Currently, there are several classes of steels in which carbon is replaced with other alloying materials, and carbon, if present, is undesired. More recently, steels have been defined as iron-based alloys that can be plastically formed—pounded, rolled, and so forth. This is a list of alloys grouped by the main metallic constituent, in order of increasing atomic number of the main metal. Under these headings, the alloys are in no particular order. Some of the main alloying elements are optionally listed after the alloy names. ↑ Engineering Designer 30, no. 3 (May–June 2004): 6–9. ↑ Erik Oberg, Machinery Handbook 24th Edition (New York: Industrial Press, 1991), 501. ↑ Michael F. Ashby and David R. Jones, Engineering Materials 2 (Pergamon Press, 1986 ISBN 0080325327). ↑ All About Oscar, Roll Out the Red Carpet, Teaching the News, March 18, 2002. Retrieved May 25, 2007. Bodsworth, Colin, and Henry Bradley Bell. 1972. Physical Chemistry of Iron and Steel Manufacture. London: Longman. ISBN 0582441161. Davis, J.R. (editor) (2001). ASM Specialty Handbook: Copper and Copper Alloys. ASM International. ISBN 0871707268. Maynard, H.B. (2005). Brass and Alloy Founding. Lindsay Publications. ISBN 1559183160. Tylecote, R. F. 1992. A History of Metallurgy. London: Institute of Materials. ISBN 0901462888. Whyman, Kathryn, Louise Nevett, and Simon Bishop. 1988. Metals and Alloys. Resources Today. New York: Gloucester Press. ISBN 0531170837. Woldman, Norman Emme, and Robert C. Gibbons. 1973. Engineering Alloys. New York: Van Nostrand Reinhold. ISBN 0442226691. This page was last modified on 8 March 2016, at 23:32.